Likely, the greatest issue people have with doctrines such as predestination is that they think it necessarily reduces humans to unthinking robots. Or, better, to inanimate pawns on a chessboard, which God moves around as He sees fit. However, this is a conclusion that is philosophically driven, and not one that is derivative from the Scriptures. The Bible clearly teaches that people have a genuine volition. That is, they make real decisions, and are really responsible for those choices. People either reject the gospel or they believe it, and when they do either they act in accordance with their will – genuinely. At the same time, the Bible teaches that all who come to Jesus Christ by faith have been chosen, or predestined, by God to come. So, there can be a tension in our minds as we try to understand these two concepts. Does God choose me, or do I choose God? And the answer, as unsatisfying as it might sound, is “yes”. A person really believes in Christ, and that is an act of his will. He willingly comes to Jesus. And yes, God predestined all who come to Jesus by faith. Predestination is the act of God, whereby He choses, for reasons in Himself, beforehand – indeed, before the foundation of the world – all who will be saved. This has to do with God’s sovereignty and His divine prerogative to do all that He wants to do. Therefore, every Christian – everyone who truly has faith in Christ has been predestined by God. That includes all Christians in the past, in the present and all who will believe in the future. There are no un- predestinated Christians. God has decided beforehand who will come to Christ by faith. Other terms used in the Bible to describe this are: elect, election, chosen, etc. They all speak to the same truth: God chooses who has been, is, or will be saved. But you can also see predestination in Romans 8:29-30, Colossians 3:12, and 1 Thessalonians 1:4, et.al. 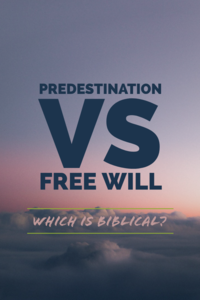 The Bible teaches that God’s purposes in predestination are according to His will (see Romans 9:11). Predestination is not based on man’s response, but on God’s sovereign will to have mercy on whom He will have mercy. It is very important to understand what people mean when they say free will. If we define free will as a will that is unencumbered or uninfluenced by any outside force, then only God truly has free will. Our wills are influenced by many things, including our environment and worldview, our peers, our upbringing, etc. And God influences our will. There are many passages in the Bible that teach this; such as Proverbs 21:1 – the king’s heart is in the hand of the Lord, he turns it wherever he [the Lord] will. But does that mean that man’s will is invalid? Not at all. When a person does something, says something, thinks something, believes something, etc., that person is really and genuinely exercising his will or volition. People do have a genuine will. When a person comes to Christ by faith, he or she wants to come to Christ. He sees Jesus and the gospel as compelling and he willingly comes to Him in faith. The call in the gospel is for people to repent and believe, and those are real and genuine acts of the will. As we mentioned above, if you define free will as totally free in the most ultimate sense, then only God truly has free will. He is the only being in the universe whose will is truly uninfluenced by outside factors and actors. Yet a person, as a being made in the image of God, does have an actual and genuine will. And he is responsible for the decisions he makes. He cannot blame others – or God – for decisions that he has made, since he acts in accordance with his genuine volition. Thus, man has a genuine will and is responsible for the decisions he makes. Therefore, many theologians prefer the term responsibility over free will. At the end of the day, we can affirm that man has a genuine will. He is no robot or pawn. He acts in accordance with his will, and he is therefore responsible for his actions. The Bible assumes, more than states, the ability of a person to make decisions and act, and the reality that he is responsible, in the truest sense, for the decisions he makes and actions he does. Several Bible verses come to mind: Romans 10:9-10 speak of man’s responsibility to believe and confess. The most famous verse in the Bible makes it clear that it is man’s responsibility to believe (John 3:16). King Agrippa said to Paul (Acts 26:28), almost you persuade me to be a Christian. He has himself to blame for his rejection of the gospel. Agrippa acted in accordance to his will. Nowhere in the Bible is there a hint that man’s will is invalid or fake. People make decisions, and God holds people accountable for those decisions. The Bible does not put human will at odds with divine sovereignty, as if only one of these could be real. It simply (if mysteriously) upholds both concepts as valid. Man has a genuine will and is responsible. And God is sovereign over all things, even over the will of man. Two biblical examples – one from each Testament – are worth considering. All that the Father gives Jesus will come to Him. They come to Jesus. They are not dragged to Jesus. Their will is not trampled. They come to Jesus, and that is an act of man’s will. The second passage to consider is Genesis 50:20, which says: As for you, you meant evil against me, but God meant it for good, to bring it about that many people should be kept alive, as they are today. The context of this passage is that, subsequent to Jacob’s death, Joseph’s brothers came to him to ensure their safety and with hopes that Joseph would not take revenge on them for their betrayal of Joseph years before. Joseph replied in a way that upheld both divine sovereignty and human will, and both of these concepts were embedded into a single act. The brothers acted with evil intent towards Joseph (the stated intent proves that this was a genuine act of their volition). But God meant the very same act for good. God was sovereignly acting in the brothers’ actions. Genuine will – or human responsibility, and God’s divine sovereignty are friends, not foes. There is no “vs” between the two, and they need no reconciliation. They are difficult for our minds to reconcile, but that is owing to our finite limitations, not to any true tension. The real question theologians ask (or need to ask) isn’t whether a man’s will is genuine or whether God is sovereign. The real question is which is ultimate in salvation. Is God’s will or man’s will ultimate in salvation? And the answer to that question is clear: God’s will is ultimate, not man’s. But how can God’s will be ultimate and our will still be genuine in the matter? I think the answer is that left alone, none of us would come to Jesus by faith. Because of our sin and depravity and spiritual deadness and fallen-ness, all of us would reject Jesus Christ. We wouldn’t see the gospel as compelling, or even see ourselves as helpless and in need of saving. But God, in His grace – according to His sovereign will in election – intervenes. He doesn’t quash our will, He opens our eyes and thereby gives us new desires. By His grace we begin to see the gospel as our only hope, and Jesus as our savior. And so, we come to Jesus by faith, not against our will, but as an act of our will. And in that process, God is ultimate. We ought to be very thankful that that is so!